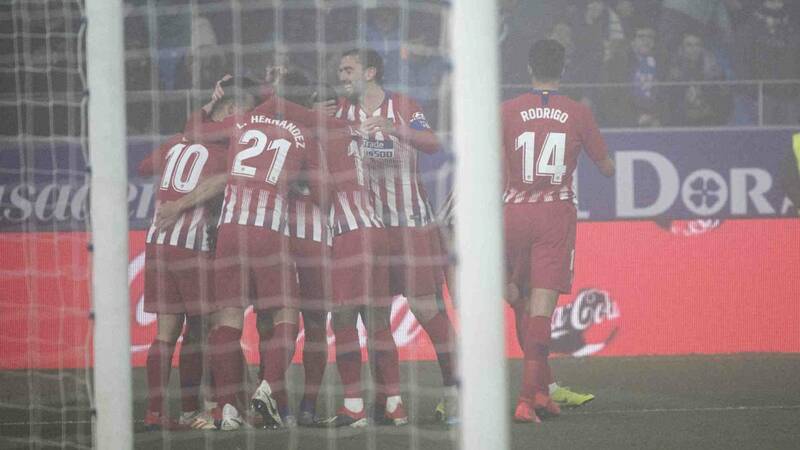 He won with authority in El Alcoraz with goals from his wings (Lucas and Arias) and Koke in his 400th game with Atleti. Debuts de Mollejo and Joaquín. Good Enric Gallego. Nothing hurts the wound in soccer better than a victory. The blackberry spot that with another is removed but with grass and ball. And the Atleti was in a hurry to sew and forget. The Cup, Girona. He did it in Huesca, El Alcoraz, under the thick fog. He started the game with this one already falling thin and Lemar asking for a ball, he wanted to be a beacon. It had not cost Cholo his eleven: he only had 11 field players of the first team, so much injury, only Juanfran remained on the bench, surrounded by kids. Guadaniesco often, Lemar from minute one asked for ball, did not hide , everything started in his boot, moving through the center rather than the band. But Santamaría stopped a spur shot of Correa in his good minutes and just after those of Huesca. Hardened, I would put Cholo's heart in his throat three times in a row. First Polished, with a ball that he sent to the wood. Then Rivera, but Giménez took the ball off when he was going to shoot. Later with Enric Gallego. And here it was necessary Oblak. Because the striker debuted in the Huesca and First, with 32 years, without surprising neither the team nor the category, and that does not so much he had to alternate football with scaffolding or truck. Three days after arriving from Extremadura, he was a starter and a torture for an incompetent Godin, always overcome. In one of those he looked for Cucho Hernández to leave him hand in hand with Oblak , who endured and held to close and stop. Another miracle more to his mittens. That's the difference between him and everyone else, any: it makes the impossible seem easy. Bajaba then the fog, very thick, like the nitrogen that thrown the guns in the discos of the years 90. And Lemar, lost under that immense megatron effect, he will still be wondering how, alone, he threw the ball in the body to Santamaría, the whole network before him. Le would return the light on the next move to make poetry with a pass to Koke. In the space, the canterano collected and sent to Lucas who, at the far post, finished and beat. It's January and here it is, not in Germany. This goal can be its own black spot to the tier. El Huesca would go to the break with innocuous domain, without bands, without pressure, without verticality. Cucho was uncomfortable on the right, only Enric was still a pain for Godín. The fog was still there, when the game returned. So dense that, of her, could emerge football players, a ball or Jack The Ripper. Football felt more than seeing itself, but Grizi put on the antifogs after Correa missed again one on one against Santamaría: he changed the game for the incorporation of Arias in the opposing band. He hit the Colombian in the air, to score with a volleyball. Yesterday it was the goal to both lateral. Hiso wanted to rebel the team, much better than what the table says, bottom, with two shots on Oblak's goal. One was taken out by Giménez, a huge Commander, the other, a shot by Moi Gómez, he would go to the corner and the fog would swallow him. El Atletico had sewn the wound and now it was time to fill the last half hour of good news. Because Koke would celebrate that he played 400 games with Atleti, so young, 27 just fulfilled, adding to the assistance before the goal. He only had to pick up the rejection of a Grizi ball to the crossbar and volley: players like him explain a shield. The second, Simeone called him. "Change!". Koke would leave, would enter one of the boys on the bench to make history: Víctor Mollejo, 40 on the back, first player of the 21st century to play in the league with Atleti. He even had a chance. It was before another debut, that of Joaquín, when the fog had already begun to rise and Atleti was leaving with his injury of cup mended. And forgotten.